Hope you all enjoyed Pongal holidays. I too had a great time with my loved ones at my native place. I am yet to come back from the celebration mood and it will take few more days to return back to my routine work. I may come up with a new recipe this weekend, until then enjoy this simple, quick recipe which I used to prepare often with the leftover rice. 1) Grind coriander leaves, green chillies, garlic and ginger to a smooth paste with enough water to it. 2) Heat oil in a wide pan. Add mustard seeds when the oil is hot. Let it splutter. 3) Add onion and saute till it becomes soft and translucent. 4) Add ground paste and let it simmer till the raw smell goes off. 5) When the water in coriander paste drained out and it looks little moist, add salt and mix well. Then, add the leftover rice. 6) Mix well with the coriander paste. Make sure that the ground coriander is coated well with the rice and there are no rice lumps. (If using leftover rice, there might be lumps here and there). 7) Let the rice heats up well in low flame. 8) Once ready, serve hot with pappad or any raita. 1) It is a very easy and quick recipe, that I often prepare with leftover rice. 2) In the same way, you can also try with mint leaves. 3) You can add peanuts or cashew nuts or channa dal while seasoning to make it crunchy. 4) I always cook this dish in low flame so that the bright green color is not lost. 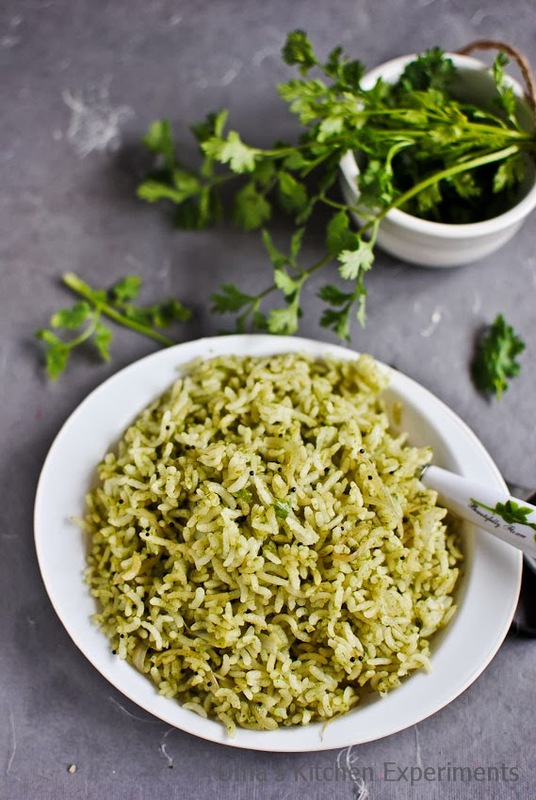 very vibrant and colorful looking coriander rice. Must try this one out in this weekend. 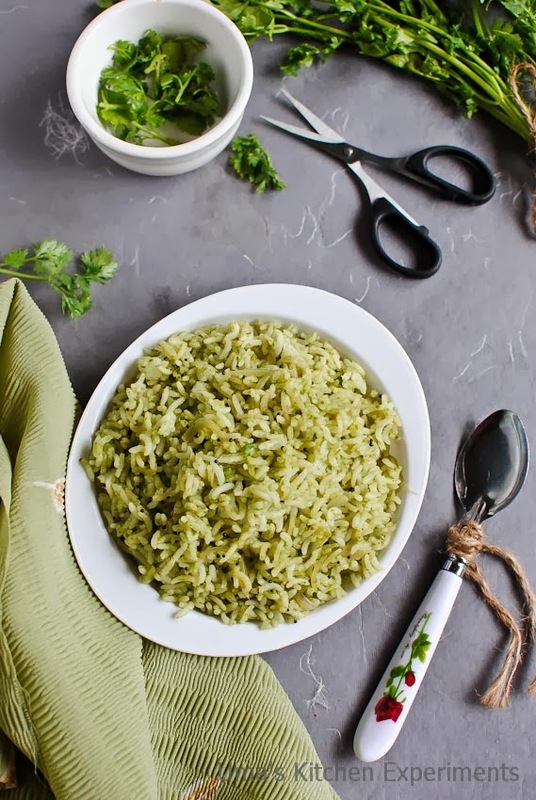 wow simple and colorful green rice... Very neat clicks and super tempting dear... love it.. Simple and tempting rice. First time here. Very happy to follow you. Do visit my space if you find time and leave your valuable comments. Good. Will try. Good exhibits of the food. 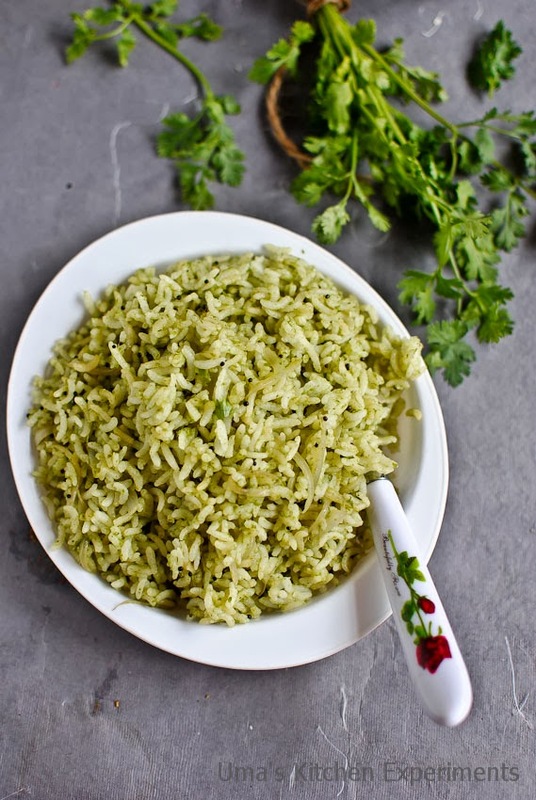 Healthy and aromatic rice.. looks tempting!! Delicious...n wat a coincidence!! Just made Pudina Biryani today!! 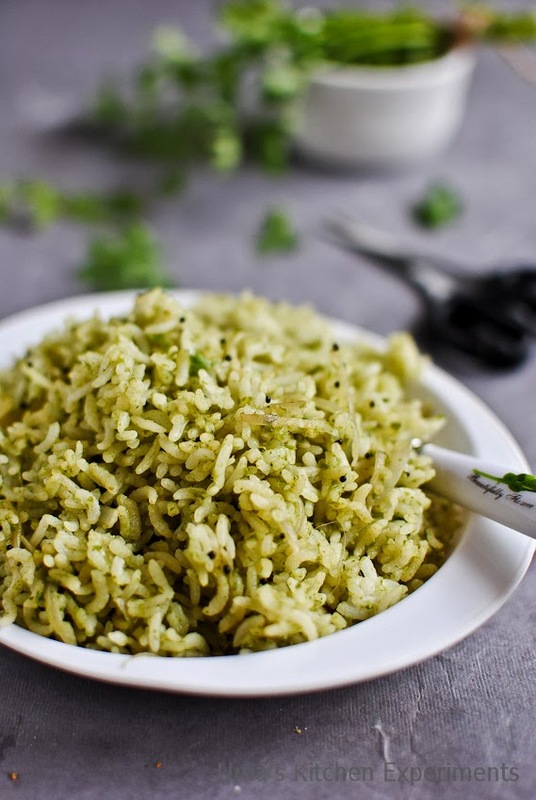 Simple yet delicious and flavorful rice...perfect for lunch box. Looks very tempting, perfect for lunch box! Neat presentation too! Such gorgeous pics on this post! I hope you got my mail on your query on baking products in chennai. Just in case you missed, youu can check at Vajravelu Mudlaiar and Venus Essences at Walltax Road, Chennai.